I have been asked by the local civilian authority to investigate the disappearance of a trader in the Rho Herculis FV-881 system. During our investigation of the wrecked ship, we determined the weapons to be Isolytic beam weapons. I was not expecting the Dia’fene senate to have destroyed their own ships. After an internal review they discovered that their intelligence service had destroyed the vessel during an experiment. The fact that the senate did not know about the experiment has raised several questions. As for our involvement I suggest that Starfleet wait until the Dia’fene can sort out their internal struggles before attempting further contact. This system is breath taking. Specifically, the planet Crateris Xc is unbelievable. Our sensors detected decalithium deposits on the planet. 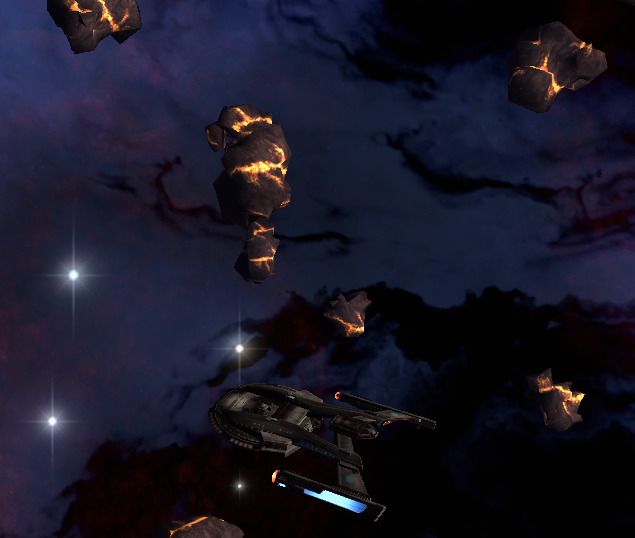 As Starfleet is searching for new sources of the ore, we beamed down to take a look. The decalithium deposits appear to be some of the richest ever discovered. I contacted Starfleet with the discovery and they immediately dispatched a mining survey team. Preliminary reports suggest that this planet will eventually become a permanent mining colony. 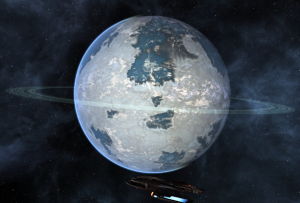 Starfleet received a request for assistance from a Tschumii colony on planet 9238-Y. The colonists detected atmospheric contamination but have been unable to determine the cause. They are requesting that we help them locate and eliminate the source of contamination. After an orbital scan we determined that there are a series of alien artifacts emitting the radiation, and with the recent seismic activity several had ruptured. 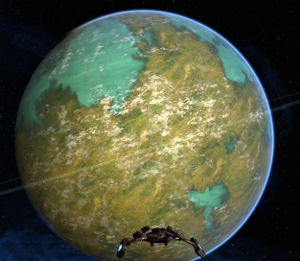 I decided to take an away team to the surface. While on the surface the Beyentic attacked they beamed down several contingents of raiders. After resetting the artifacts, the Beyentic left. This leads me to believe that they were responsible for the whole incident. I filed my report with Starfleet command listing them as the possible culprit. After contacting the lieutenant, I was award the 1440 Dilithium ore for a successful exploration tour. I was then contacted by Admiral Quinn, I have received a promotion. I am now commander (20). I will report on the new ship and promotion soon.